Samsung delivers a winner in the Captivate Glide, an Android smartphone that includes a slide-out QWERTY keyboard for the messaging minded mobile user. The Captivate Glide takes the base AT&T Galaxy S II design and slaps a glide-out QWERTY keyboard on to satisfy those who need physical keys for pecking out messages. But is that all the Captivate Glide offers? 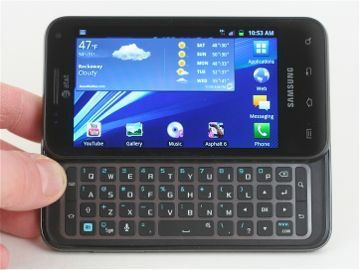 The Captivate Glide from Samsung adds a slide-out QWERTY keyboard to the familiar look of Samsung's Galaxy phones. It is fast, svelte, and has a great display. AT&T today announced that it is resuming delivery of the Android 4.0 Ice Cream Sandwich update to the Samsung Captivate Glide. The update had been put on hold for further refinement. They regressed from the 5-row keyboard on their Epic 4G. And ergonomically speaking, the keys need to be in staggered rows, not the square grid they always use. It really seems like this one was an afterthought, not one that actually had any careful design put into it.